Kesha Lends Her Voice To A Remix Of The Struts' "Body Talks"
Laying her distinctive vocals over the sassy instrumental, Kesha brings a new dimension to the release. She also paired up with the band in St. Louis for an appropriately glam video. Considering her track record, it is hardly surprising that the Lagan Sebert-directed project is a glittery extravaganza. 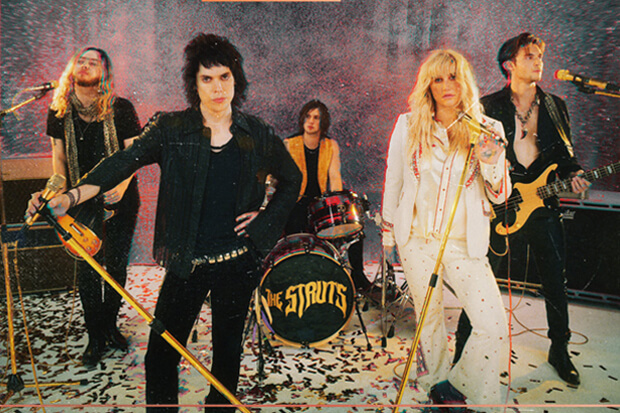 Switching between a red catsuit and a bedazzled white pantsuit, she and The Struts frontman Luke Spiller deliver particularly wild performances. The end result is fun, brazen and could easily become a major hit. It also reminds me of some of the rock-centric songs that made the tracklist for last year’s Rainbow, which is always a plus. Although she may have landed a bevy of pure pop hits over the years, the hitmaker is a pro when it comes to hopping across genres. And this is just more evidence. Give the track a listen and check out the video below! Do you love the new version of “Body Talks”? Let us know below, or by hitting us up on Facebook and Twitter!